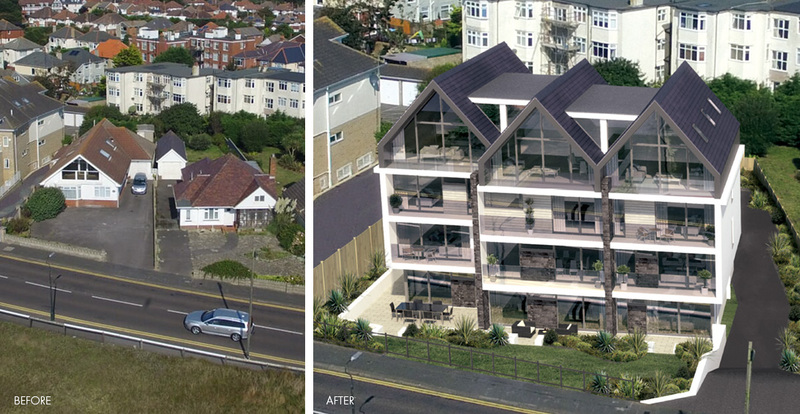 Having previously received a refusal for their planning application with a different developer, the owners of the two bungalows on this site, were initially reluctant to go through the planning process again. However, after getting to know us a little and how we work, they took a deep breath and put their trust in us. With a lot of thought and communication with the case officer, our planning consultants and architects, Harlequin Homes managed to design a stylish, contemporary building that was sympathetic to both its environment and local planning policy. The site had previously received a refusal at Appeal. The planning application included detailed surveys and reports such as topographical, arbocultural, ecology, drainage and highways, all of which need to be relevant and highly detailed. Designing and implementing a drainage strategy that respects the structural nature of the local soil. Maximisation of sea views, whilst respecting the privacy of neighbouring properties. The original building on this site, had been converted from a private residence to nursing home, but in more recent years was used (illegally) as an HMO (House of Multiple Occupancy). Built in approximately 1918, the property later had many unsympathetic extensions, which rather spoiled its visual appearance. Harlequin Homes were approached by the owner to assist in maximizing the value of either the existing building or potential development on the land. We did extensive feasibility studies to explore the option of converting the property into residential apartments, but the building’s poor structural condition rendered this unviable. 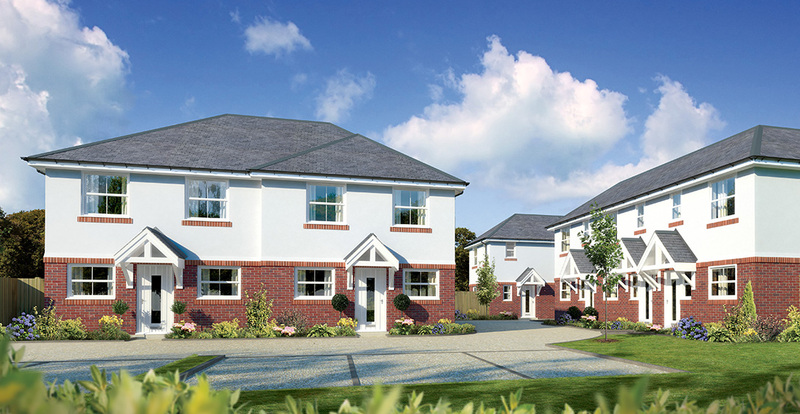 Consequently, Harlequin Homes set about designing a brand new Georgian-style building that would both stand out as a “landmark” in the Conservation Area, and sit sensitively within its pretty sylvan setting. Subsequently, despite this being a contentious site, Harlequin Homes achieved planning permission for 11 x luxury two-bedroom apartments. By working closely with local residents, who were largely in favour of the scheme, the local Ward Councilor (also in favour) and a number of expert Heritage consultants, we were able to identify and respond sympathetically to the concerns with redeveloping this building as well as its change of use. The site is within a Conservation Area. This always increases the complexity of any planning application. Designing an authentic Georgian-style building that enhanced the character of the Conservation Area (over and above the original building). This is an expensive and painstaking task that requires expert advice and architectural skill. Regular consultation meetings with local residents to explain the scheme and consider their concerns and wishes within the design. Demonstrating the non-viability (in financial terms) of converting the existing building. The detailed landscaping scheme involves planting additional semi-mature trees as well as other considered plant species. Seeking the expert (and expensive) advice of several Historic Buildings consultants. From the early stages in 2014, when Harlequin Homes purchased a section of large rear gardens from two local residents, Maple Grove has extended to a private housing development of 24 homes. By amalgamating land from nine sets of neighbours, we have been able to bring a range of 2 and 3 bedroom houses to this popular neigbourhood in the centre of Weymouth. We have successfully built and sold Phases 1& 2 and are currently embarking on the build of phases 3 and 4 (both should be complete in Spring 2018). The project has presented many challenges, but none that we couldn’t overcome with our range of skills and experience. We have also had to negotiate access rights with Weymouth & Portland Borough Council in order to create a safe and practical roadway into the development. Flood risk reports – to protect the site against predicted flood risk through the next 140 years. Bio-diversity reports, demonstrating how we would mitigate any harm to wildlife. Arboricultural report – how we work around the existing trees and the planting of new. This was a disused dairy farm barn that had more recently been used as a café. The business was struggling – largely due to the considerable cost of maintaining and heating this very run-down 250 year-old building. The owners had recently had an application to convert the barn into two 3-bedroom homes refused and were concerned that their primary asset was not providing any income or capital return. By working closely with the case officer and senior planning officer at Purbeck District Council, we were able to identify and respond sympathetically to the concerns with redeveloping this building as well as its change of use. 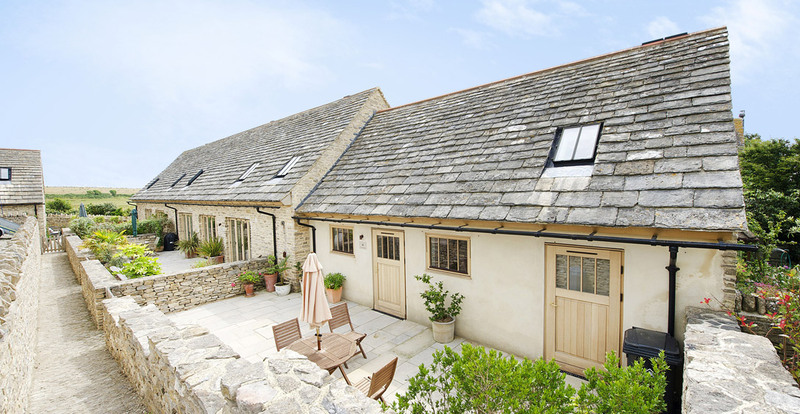 In considering the local and national planning policy framework and employing one of the Country’s top "heritage" architects and a conservation specialist, we were able to achieve approval for four 3-bedroom barn conversions – three from the original building and an additional new-build in traditional style. The site is within a Site of Special Scientific Interest (SSSI), an area of Outstanding Natural Beauty and a Conservation Area. Overhead electricity cables needed to be redirected below ground with archeological implications. A natural spring running through the site. Bats and newts were both present on site. Many of the barn’s original features were of architectural and historic significance (including Purbeck-stone roof tiles and Queen Anne oak joists). 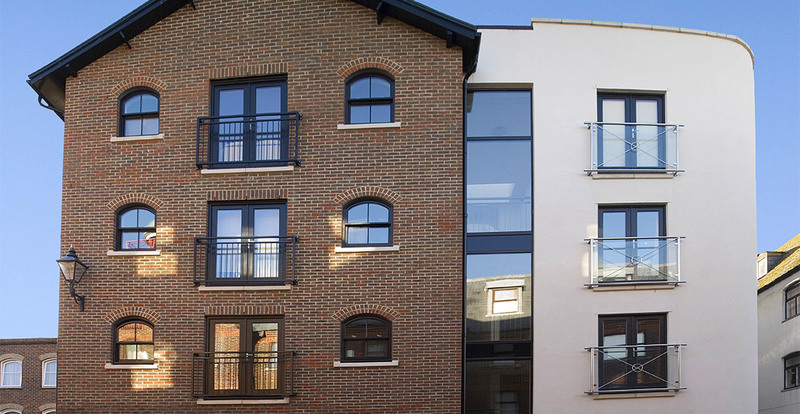 Located close to the historic Poole Quay, this development of twelve 1 and 2-bedroom flats was designed to reflect the warehouse style in the immediate vicinity, together with a contemporary style extension in order to reduce the bulk of the building. This modern extension features a curved wall, which reflects the curved wall on the existing building adjacent and creates an interesting juxta-position between old and new that sits well in this fiercely protected Conservation Area. Cycle parking was included in the design, as no car parking could be provided on site. This is due to its town centre location and the physical restrictions of the site – primarily, its close proximity to surrounding buildings, including the listed building, Hennings Wharf, which it abuts to the rear. The building was also designed to sit slightly elevated to the ground level, in order to afford an element of privacy to the ‘ground floor’ apartments and to respect environmental flooding criteria. 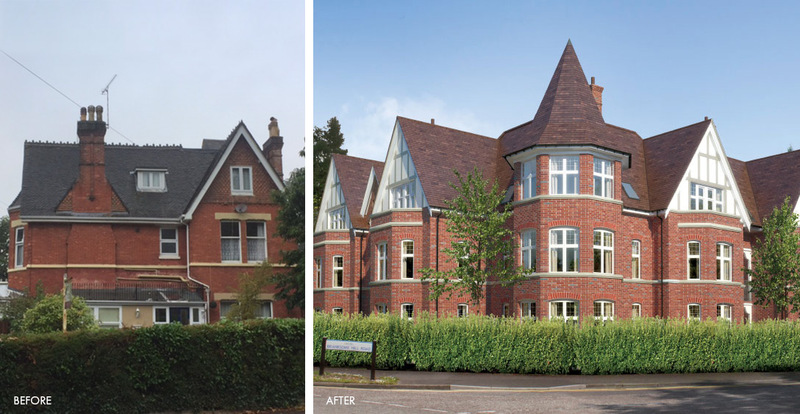 In the design and build of these twelve apartments, we were able to satisfy all of the planning, conservation, environmental and health & safety challenges that the site and historic nature of the existing building presented. Just as importantly, we achieved all of this through a commercially viable and successful scheme.